The latest on the bombings in the Thai capital (all times local): 3 p.m.
Police say a construction worker found a grenade buried in land in a residential area far from the city center but they believe it is unrelated to last week's bombing that killed 20. Lt. Sakon Rungkiatpaisarn of Pra Kanong Station said the grenade was found Monday morning buried in a plot on Sukhumvit 81 being prepared for construction. He said they don't know where it came from and authorities "do not think it has anything to do with (last Monday's) bombing" at a major intersection in the middle of Bangkok. Sakon said a police explosives squad was sent to defuse the grenade. The Foreign Correspondents' Club of Thailand has expressed dismay at the detention of a Hong Kong journalist for carrying body armor and a helmet. Hok Chun Anthony Kwan, who was assigned by Initium Media Technology to cover the aftermath of last week's bombing in central Bangkok, was stopped at the Thai capital's international airport on Sunday when authorities found a flak jacket and helmet in his carry-on luggage before he boarded a flight to Hong Kong. He is being charged with possessing an illegal weapon, which carries a prison sentence of up to five years. "Body armor and helmets used by journalists are not offensive weapons and should not be treated as such," the FCCT said in a statement Monday. Bullet proof jackets are considered military equipment in Thailand, whose laws prohibit their possession without a license. However, the law is almost never enforced and journalists have openly worn body army during recent political turmoil in the country. 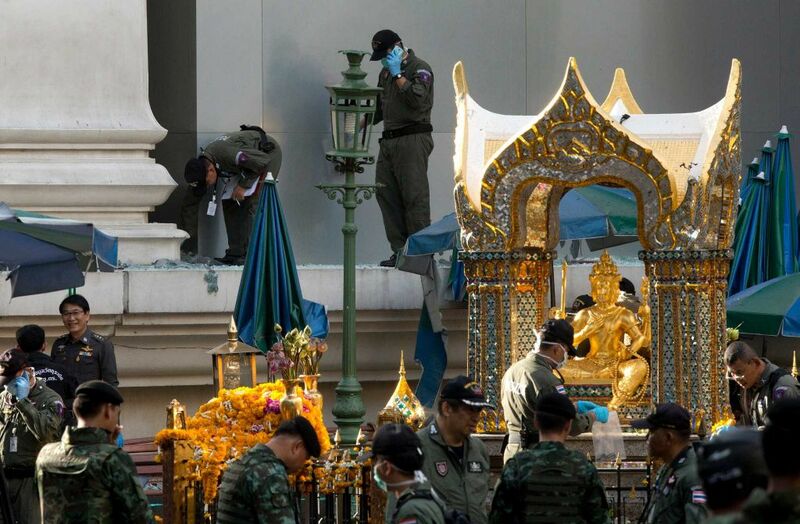 Thailand's police chief says the investigation into last week's bomb blast has been hampered by broken security cameras in central Bangkok along the main suspect's getaway route. National police chief Somyot Poompanmoung said Monday that police were trying to "put pieces of the puzzle together" but had to use their imagination to fill holes where street-side security cameras were broken and unable to record the suspect's movements. Somyot said, "Sometimes there are 20 cameras on the street but only five work." He added, "We have had to waste time to put the dots together." Last Monday's bombing at the Erawan Shrine in central Bangkok left 20 people dead and more than 120 injured. Police have released an artist's sketch of the prime suspect who is seen on security footage leaving a backpack at a bench inside the open-air shrine and walking away. The explosion takes place 15 minutes later. On Sunday, Somyot said that police would "need some luck" to track down the suspect, while other police officials said they believed he had already left the country. Thousands of servicemen marched in downtown Kiev on Monday to mark Ukraine's Independence Day. The troops carried rifles but, unlike last year, the parade did not feature any of the more powerful weaponry which could be viewed as sensitive as Ukraine is mired in a conflict between government forces and Russia-backed separatists. The conflict in the east, which has claimed more than 6,800 lives since it began in April 2014, saw a major uptick in violence last week with nine civilians and soldiers killed in just one day. Speaking at the parade, President Petro Poroshenko said Ukraine would continue to increase its troop numbers in order to fend off the attacks of separatist rebels. The press office of the Ukrainian military operation in the east said Monday that the rebels violated the cease-fire 82 times overnight, in some cases with large-caliber weapons that should have been withdrawn in line with a truce signed in February. In Rome, Pope Francis made his latest appeal for the end of fighting on the eve of the Independence Day. "I renew my heartfelt appeal, so that the commitments undertaken to achieve pacification are respected, and with the help of organizations and people of good will, the humanitarian emergency in the country is responded to," Francis told tens of thousands of people gathered Sunday at the Vatican in St. Peter's Square for his traditional window appearance. "May the Lord give peace to the beloved Ukrainian land, which is preparing to celebrate the national holiday tomorrow."